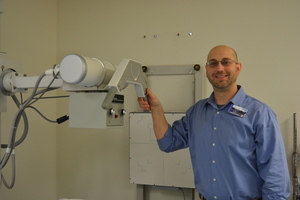 When I signed up for the Radiography program at Pima Medical Institute, I was a full-time husband, a full-time dad, and I had full-time bills and responsibilities. 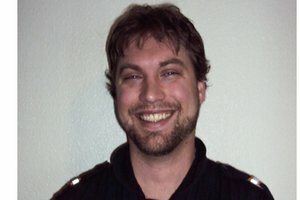 I worked nights as a patient care technician while attending school during the day. During my clinical rotations, I would leave my house early Tuesday morning, work my rotation from 7:30 am until 5 pm, go straight to my job, and work from 6 pm until 4:30 am. Then, I would take a shower at the hospital, drive to my clinical rotation, sleep for a little over an hour in my truck, and do it all over again. On Saturday morning I would return home to my wife and 4 kids. I did this for the last 16 months of my program. If it weren't for my family and my Lord, I would not have been able to do it. Because of their support, I graduated from PMI with a 3.8 GPA. My PMI instructors had a passion for what they taught and they cared for their students. In fact, they are among the best people I've ever met in my life. My classmates and I helped each other through and became like a family. I currently work for two great companies - St Joseph's Hospital and Honor Health. 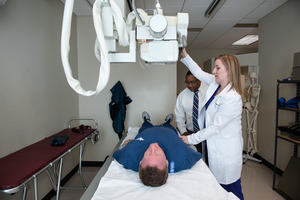 They are training me in interventional radiology, not typically an honor given to new graduates. I love my job and am thankful for my education at PMI. It's been worth all the hard work and sacrifice. I'm here to tell everyone that no matter what you're facing or going through, if you're willing to make the sacrifices you can do anything! I was working in the veterinary industry and had gotten my bachelors in animal sciences intending to become a veterinarian. While working at a small animal clinic, I became very interested in the x-ray area and gradually became the x-ray go to person. Later I had the opportunity to work for an animal radiologist. One of my co-workers was going to PMI and I would help her study. She had all these cool assignments that fascinated me. She encouraged me to go to PMI's info session. It felt strange because I already had my bachelor's, but I went and I got so excited about the possibility of learning more and doing what I really wanted. I had gone to Oregon State Univ and it was hard but you're in classes of 500 and you're just a number. If you're struggling, you have to set up an appt. Help isn't really available. No way do you raise your hand in class to ask a question. At Pima is challenging but the instructors want you to succeed. Its hard but the instructors give you all the tools you need to succeed. As a student because its such a small learning environment questions are encouraged. Not only do they encourage asking questions, they were willing to take the time to explain and make sure you understand the material. They care! The two years went by SO fast. They make if fun. They cater to different learning styles. I'm tactile learner, my friend was a visual learner and they teach to your style. During my externship I got to work with my former co-worker and she said, "You did it!" I am so thankful for her encouragement to go to Pima. After graduating I got a job with the University of Washington and I am also working with the Seattle Mariners. I found I really love orthopedic medicine and I am having so much fun! PMI was such a fantastic experience! It changed my life! I felt 100% prepared to go into the workforce !I now have the pleasure of going to work every day knowing I am making a difference. It is so rewarding and I love what I do! 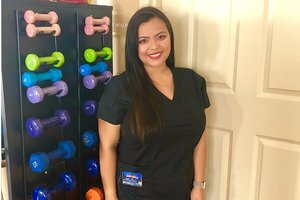 Ronda Figueroa, a Tucson Physical Therapist Assistant (PTA) graduate in 2006, is currently a full-time faculty member of the PTA program she graduated from. 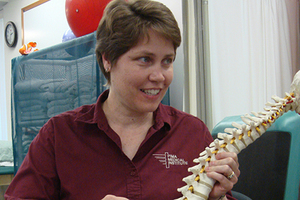 Prior to her education at PMI, Rhonda worked in a physical therapy office as a technician. Because of the limited duties as a technician, Rhonda was seeking a way to be more challenged at work. 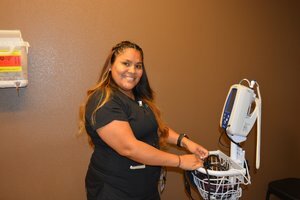 So when PMI started the first PTA program at the Tucson campus in 2006, she jumped at the opportunity to graduate from an accredited PTA program and in turn improve her technical skills, critical thinking, and ability to help the patients she served. As a student at PMI, Rhonda had a "very good experience," but a challenging one compared to previous college due to her family responsibilities. According to Rhonda, "having a family made school a challenge, but it also helped because my family was so supportive." Rhonda went on to state, "The education at PMI was outstanding, I was prepared for the workforce, and I passed the national exam with a 784 out of a total of 800 points." The 98% Rhonda received was one of the highest scores in the country. After three years of practice as a licensed PTA, Rhonda started teaching in the PTA department at PMI and has been in that position for over 4 years. Is Rhonda a good teacher? Her students reported the following comments: â€¢	"She loves to teach, knows how to teach, and has knowledge about everything" â€¢	"She doesn't talk down to us and is always willing to help by staying late or coming early" â€¢	"She is concerned that you understand the material and cares enough to reinforce it" â€¢	"She prepares us for the real world" As a teacher, Rhonda has been known to use innovative teaching methods. For instance, she often requires students to learn line dancing in lab to better understand human motor development. 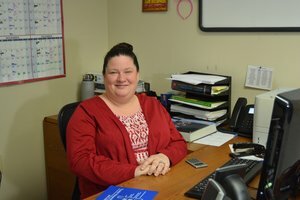 Rhonda's favorite part of being a teacher is the fact she gets paid to talk about a subject matter she loves and that she learns something new every day. Happiest when students are graduating and beginning their careers as a PTA Rhonda stated, "I love seeing the evolution of people that know nothing about physical therapy. We put them through a grinder and it spits them out as a PTA." Rhonda continued by stating, "Personally, I have seen PMI improve the qualities of people's lives." 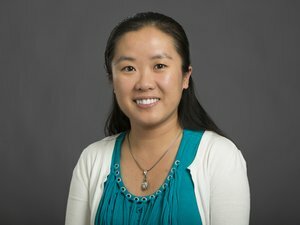 Rhonda aspires to continue her life-long learning by obtaining master's degree over the next few years. At the age of 15, I knew I wanted to serve others. I joined the U.S. Air Force when I was 18 and spent 27 years serving this country. 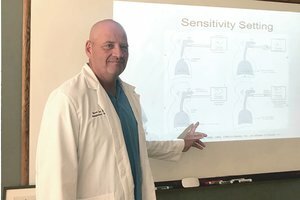 Upon retiring from the military, I elected to return to school for Respiratory Therapy. My mother was a Respiratory Therapist, and I enjoyed her stories about how she had helped not only the patients, but the patients' families during their time of need. I heard a commercial on the radio about Pima Medical Institute, and three days later I completed my entrance test and was accepted for a class. Upon finishing school, I started working at a level two trauma hospital, and then I moved to a level 1 trauma hospital that also took care of children. I felt blessed to have the opportunity to help students from PMI as an instructor while I worked at the hospitals. This gave me the feeling of giving back to the school from which I graduated. I also continued setting educational goals, completing my master's degree in Health Care Administration and beginning part-time work for PMI as a clinical instructor. In December 2017, I returned to the Renton Campus, the same one from which I graduated just seven years earlier, as a full-time instructor. PMI not only helped me achieve my professional goals, they have helped me realize my personal goals through my educational development. Moreover, they have given me the opportunity to be a positive role model for my children while providing them with a higher quality of life. I was a practicing massage therapist for several years before deciding to pursue a career as a Physical Therapist Assistant. I've always loved helping people manage their pain, but was frustrated I couldn't do more. After some diligent research, I took a tour of Pima Medical Institute of Las Vegas and I knew without a doubt I wanted to be part of their community. The instructors were amazing! They addressed the needs of every single individual and were able to utilize different teaching styles in order to keep our class engaged. I appreciated the real life expectations our instructors gave us of the profession and know it helped prepare us for our first job. The camaraderie of my classmates also really enhanced my experience. We were truly a family and helped each other through the program. 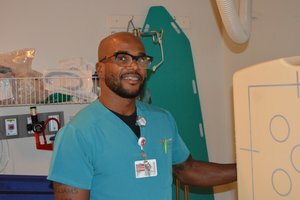 I currently work at Advanced Healthcare of Las Vegas, a skilled nursing facility, where I was sent to for my final clinical internship while at PMI. I remember being hesitant about the setting but after the first couple of days of my internship, I adored it. Our PMI instructors provided us with a strong foundation and a thirst for knowledge to keep moving forward. I have recommended this program, and in fact, my husband, my brother, and my best friend are now also graduates of the PTA program at Pima Medical Institute. Thanks PMI! I was a single mom and was in and out of menial jobs living paycheck to paycheck for many years. Several years ago I attended my sister's graduation from Pima Medical Institute. I recall how inspired I felt watching her walk across that stage and it made me want a better life. But at the time, I just didn't believe I could do it. Last year I finally signed up for the Medical Assistant program. I would work all night, grab a couple hours sleep, get my kids off to school and take the bus to PMI. Sometimes I'd fall asleep waiting at the bus stop. There were days I didn't have money for the bus or for daycare so I would miss classes. Sometimes my budget felt so drained, I was too tired to even get up. It was a low point when I was dismissed from the program because of my absences. Life was so hard; there was even a time when we were homeless. When PMI offered to give me a second chance, I just knew I was not going to let anything get in the way. I wanted a better life and I wanted a career for my children's sake. My teachers were wonderful and welcomed me back. PMI totally changed my life. Before my externship was even finished I prepared my resume and began looking for jobs. When Affiliated Dermatology called me for an interview and later offered me a position on their team, I was thrilled! I got to walk across that stage and I am so happy with my new career! One thing I learned through my journey at PMI is there are going to be set backs, but you just have to keep going. I love Pima Medical Institute! 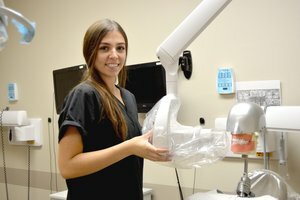 I had recently graduated from high school and was considering becoming a dental hygienist, when I heard an ad on Pandora for Pima Medical Institute's Dental Assistant Program and decided to enroll. I found the program to be pretty intense and I even considered dropping out at one point. But, my instructor was amazing and I made some of the best friends I've ever had. When it came time for me to begin my externship, I felt extremely confident that I was prepared. This is due to the thorough hands-on training the program provided me. 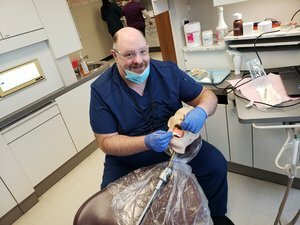 In fact, on my first day of externship, my dentist told me I was born for this and I was offered a job! That was pretty fun and after I completed externship I started there as a dental assistant. There were times when I wanted to give up, but now I am so thankful that I persevered and finished the program. Graduation was amazing and I was so proud to walk across that stage! My PMI experience not only provided me with the skills for a great job, but it instilled me with confidence. I have decided to continue my education, not as a hygienist as I originally thought, but as dentist or orthodontist. Thanks PMI! When I was 18 years old my dad really wanted me to go to Pima Medical Institute; in fact, he offered to pay my tuition. But I told him I wasn't interested because I wanted to go to a four-year college. Well that never happened, and I always regretted my decision. I ended up working for TPA (Third Party Administrator) for 22 years, followed by several low paying dead end jobs. I finally decided it was time to go to PMI. After meeting with an advisor I chose the Medical Administrative Assistant program. At age 42, I was a little scared to go back to school, but my classmates became my friends, despite my age. I completed the program with a 4.0 GPA! My instructors were excellent and had experience in the field, which helped with realistic expectations. As a result, I felt prepared for my externship. I was offered a job during the first week, which I accepted. My plan is to continue my education by earning my associate's and bachelor's degrees through PMI's online Health Care Administration Program. My long-term goal is to work in hospital human resources. I want to keep learning and be an example for my kids. If you want to work in the medical field, come to PMI. You get the education and the experience you need in a short amount of time, you walk out with a career, and they help you find a job. That's more than a four-year university offers!